Would you like to watch the 2018 King George VI Chase live online? In this post, we’ll explain how to stream this, and every other 32Red Winter Festival race for free. 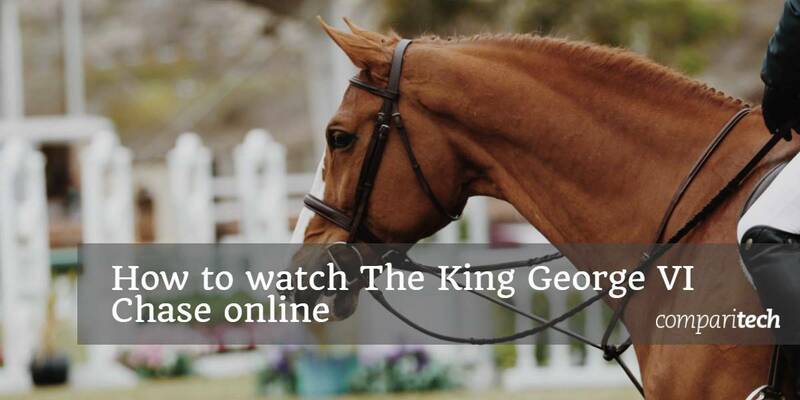 We’ll also show how to watch the King George VI Chase from abroad with a Virtual Private Network (VPN), and recommend the best VPN to use. The 2018 King George VI Chase is scheduled to begin at 3:05 PM GMT (7AM PST/10AM EST) on December 26 (Boxing Day). It’s the penultimate event in the 32Red Winter Festival at Kempton Park, England, but also the most profitable, with £250,000 in prize money at stake. Rather stay in on Boxing Day? No problem: below, we’ll explain how you can stream the King George VI Chase in its entirety online. However, you should note that if you’d like to watch this race for free outside of the UK, you’ll need a high-speed VPN capable of unblocking ITV Hub abroad. This article will only recommend official broadcasters. Although events like this often have unlicensed streams, they come with significant disadvantages. For a start, unofficial streams are often laggy and low-resolution. There’s also a good chance they’ll be taken offline before the end of the race. You can watch the 2018 King George VI Chase for free anyway, so there’s no reason to use unlicensed streams. VPNs are a great way to increase your online security. They encrypt your traffic, preventing third parties like your Internet Service Provider (ISP) or hackers from keeping track of your activities. These services also allow you to spoof your location and access geo-blocked services from outside of their intended broadcast regions. ExpressVPN is our first choice: it’s a high-speed VPN with more than 2,000 servers spread across 94 countries. Further, it’s able to unblock popular platforms like Netflix, Amazon Prime Video, and BBC iPlayer. Registration is easy and only takes a minute: just choose your desired subscription length (one month, six months, or a year) and pay. If you’re only looking for short-term coverage, for instance, if you’re going on vacation and want to watch the King George VI Chase while abroad, you can take advantage of ExpressVPN’s 30-day money-back guarantee. An upfront payment is required, but you can cancel during this period to receive a full refund, no questions asked. BEST VPN FOR THE 32RED WINTER FESTIVAL: ExpressVPN offers fast speeds, a large server network, and excellent unblocking capabilities, making it ideal for those looking to stream the King George VI Chase online from anywhere in the world. First, sign up for a suitable VPN service. We’ve already mentioned ExpressVPN but you might also want to consider NordVPN and CyberGhost: two worthwhile, low-cost alternatives. Install the VPN app. There will be a few different versions so be sure to get the right one for your operating system. Connect to one of your VPN’s British servers. Try watching a video on ITV Hub. It should load almost immediately but if not, clear your cache and cookies, then refresh the page. We strongly recommend running through the steps above well before the race begins. This way, if anything doesn’t work as intended, you’ll still have time to contact customer support and resolve the issue. Remember that this event is live, so if you realize too late that your VPN doesn’t work, you’ll miss part of the race. It’s actually very simple to watch the 32Red Winter Festival events online. You have two choices: stream the 2018 King George VI Chase for free on ITV Hub or pay for a Racing UK subscription. Obviously, if you don’t normally watch horse racing, ITV is the better choice. ITV will be showing the entire 32Red Winter Festival, with coverage running from 12:50 PM GMT(5AM PST/ 8AM EST) until 3:40 PM. As a bonus, you’ll be able to watch all of the day’s action from the first day of the Yorkshire Christmas Meeting at Wetherby Racecourse. Racing UK has a far wider selection of live horse races to watch, but it’s a premium service. It costs £24.98 per month, although day passes are available for £10. There’s really no need to pay to watch this event however, as it’ll be streamed in its entirety on ITV. You should note that both of these services will show the race as it airs on TV, so you will need a UK TV License. This is easy to accidentally overlook as neither service actually checks to see if you have a TV License or not. Can I watch ITV or Racing UK abroad? You can sign up for either service from outside of the UK as long as you have a VPN. 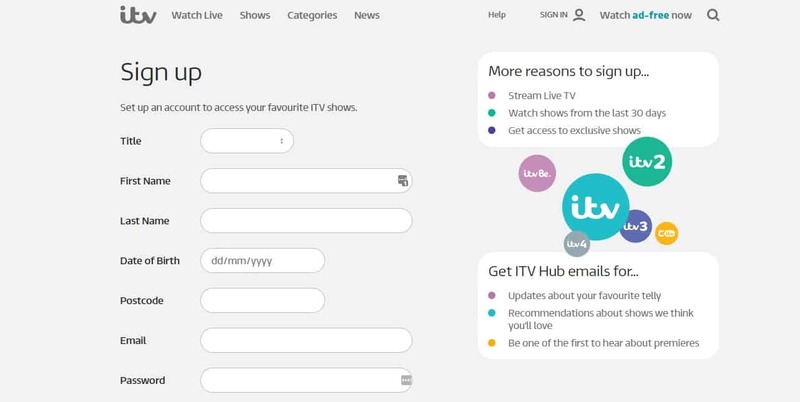 Although ITV Hub asks you to enter a British postcode when registering, this doesn’t appear to be verified. Once registered, simply connect to one of your VPN’s British servers and you should be able to watch as though you were in the UK. Note: if your VPN is unable to bypass the ITV Hub’s geo-blocking, you may have better luck on TVPlayer.com — another legitimate site with an ITV live stream. Racing UK accepts payments via Visa, Mastercard, and Maestro. If you’re determined to register from outside of the UK, you can do so using a prepaid card from any of these providers. If you do go the prepaid card route, it’s important to research the marketplace and seller you buy from, however, as it’s sadly not unheard of to pay for a code that has already been redeemed. Can I watch the King George VI Chase with a free VPN? If something sounds too good to be true, it usually is. Free VPNs actually have several major disadvantages that prevent us from recommending their use. For instance, these services usually have more users than their networks can reliably support. The added strain this places on the network causes slow speeds, which leads to stuttering video, and potentially even disconnection from the VPN. Additionally, most free VPNs can’t bypass geo-restrictions on popular streaming platforms so you may not be able to watch the race at all. Although these providers don’t bill you upfront, their services are far from free. Often, you’ll have to put up with large, obnoxious ads that cover the sites you visit, and you may even be offered increased speeds in exchange for a monthly fee. However, some services use tracking cookies to monitor your activities, logging information such as your favorite websites and how often you visit them. The resulting consumer profile can then be sold to third parties without your knowledge or consent. To make matters worse, it can be difficult to find a trustworthy, safe, free VPN. Research shows that the Google Play Store is home to dozens of malware-carrying apps posing as free VPNs. Unfortunately, the virus-free surveyed apps aren’t always safer, with 18% using no encryption and 84% leaking information over IPv6. Even some well-known providers need to be treated with caution, as we found out during the Hola botnet scandal in 2016. To keep yourself and your personal information safe, we recommend using a reputable VPN with a proven track record of prioritizing its users’ privacy. Which horses are expected to do well? Kempton Racecourse is a flat, three-mile long track. However, there’s no time for rest; jockeys usually go all-out from the start in this race. As such, the winning horse has to be one with both speed and stamina. Might Bite is definitely one to watch. He’s an Irish nine-year old thoroughbred with four years of experience. More importantly, he won the last King George VI Chase and came second in the Gold Cup earlier this year. Of course, Might Bite came in fifth during the Betfair Chase. Worryingly, the four horses that were out in front are also competing in this event. Bristol De Mai and Native River both have real each-way potential. They’ve both proven that they’re capable of leading the pack and even making a comeback from the rear when necessary. Bristol De Mai has placed in 17 of his 20 chase races, and Native River has never failed to place. It’s worth mentioning that Native River currently holds the Gold Cup, although his trainer also works with Thistlecrack, so we can reasonably expect a good run from this horse too. 4 Can I watch ITV or Racing UK abroad? 5 Can I watch the King George VI Chase with a free VPN? 6 Which horses are competing? 7 Which horses are expected to do well?